Ladakhi's rough terrain is legendary for the challenges and thrill it poses to bikers and adventure lovers. The dusty roads curling around massive mountains and stretching into oblivion lure motor biking enthusiasts from all across the world. It is a very rewarding experience for amateurs and experts alike. Picturesque villages nestled in the beautiful and bare Himalayan ranges welcome travellers along their journey. Smiling weather-beaten faces appear in doorways inviting you in for tea. 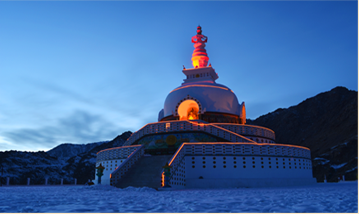 Buddhist monasteries (gonpas) give a magical feel to the landscape in their splendid isolation. Buddhist prayer flags fluttering atop houses, passes and monasteries spread their mystical chants into the Himalayan atmosphere. ‘Om Mani Padme Hum’ is engraved on stones covering monasteries, marking high passes and entrances. Chortens signifying Buddha’s mind dot the barren background. The routes from Srinagar to Leh/Manali to Leh offer best passage from mid-June to September end. Frozen Himalayas have tailor-made and regular travel packages for clients. Daring, risk, thin air, wet boots - this is Himalayas!